Pancake (low profile) load cells feature a compact size and are used for both compression and tension measurements. Our range from Lord Sensing Stellar Technology includes general purpose, high accuracy pancake load cells and precision pancake load cells which offer low off-axis sensitivity and shock and vibration resistance.The design can be customised to your requirement with many selectable features and options - Contact us to discuss. The PNC772 low profile, lightweight and precision pancake load cell series from Stellar Technology, offers maximum load ranges of 25lbs, 50lbs, 100lbs, 200lbs and 300lbs with an accuracy of ±0.05% FSO BFSL. 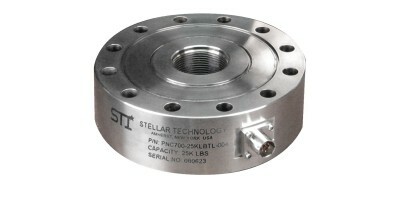 The PNC772 from Stella Technology load cells is designed with a bolt-on flange electrical connector, constructed of light weight aircraft aluminium for weight limited applications and incorporate an integral base for a more compact design.